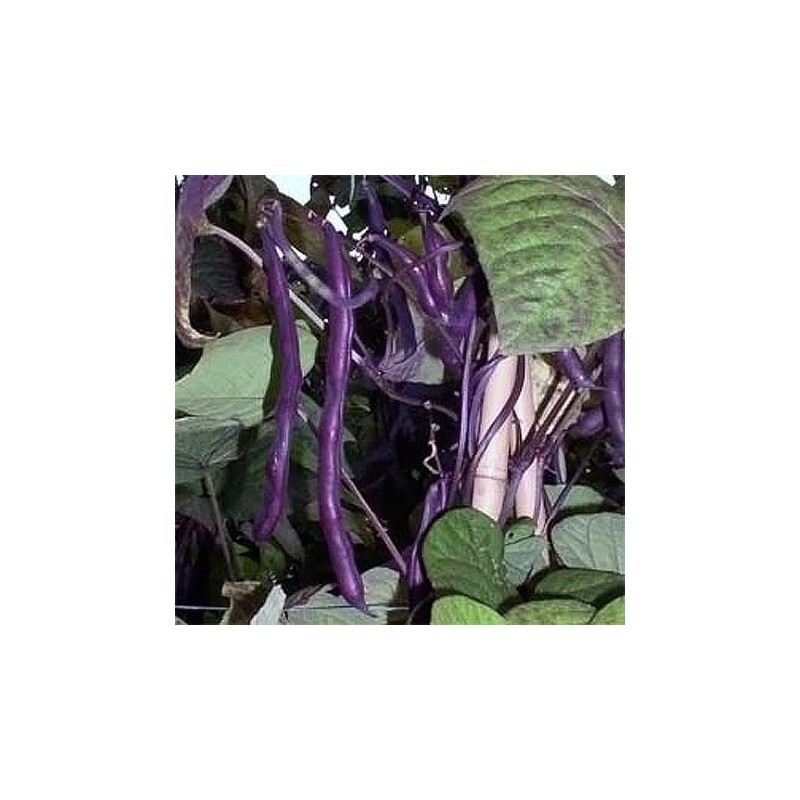 A purple podded climbing french bean. The strong growing plants will produce 10 inch long purple pods over many weeks. Producive and attractive plants, a really great addition to your garden or allotment plot. One of our many heirloom vegetable seeds. Beans are a good source of vitamins A and K. Always cook before eating. Whether you call them French beans, green beans, snap beans or string beans, they are a popular and versatile vegetable that is easy to grow in any home garden. Enjoy this long, green vegetable steamed, pickled or boiled, as a side dish or main dish, in the hull or shelled. Anyway you choose to eat French beans are good, but first you need to know how to grow them in your own home garden. Sun, sun and more sun is the desired real estate location for growing French beans. Select a full sun location that has well-draining soil. French beans produce runners and will need a support system to keep them upright and growing strong. Read the label on the seed packets to determine how long the plant runners will be because they do vary greatly. 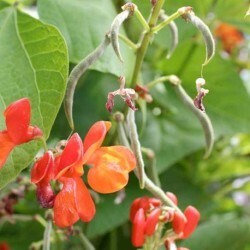 For example, the bush variety may only produce a few wayward runners that are about 1-2 feet in length, white half-runner beans will produce runners that range in length from 2-4 feet, pole bean varieties will produce runners that can reach a mature length of 6-8 feet. 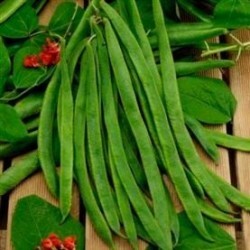 French beans do develop deep roots to help support their growth and voracious appetite for food and water. Till the garden soil deeply, between 12-18 inches, so the deep plant roots will have no trouble growing and searching for nourishment. Top the tilled soil with 4 inches of compost and lightly till it into the soil so the French bean plants will have a ready food supply when they begin to grow. Lay off planting rows of 6 inch deep trenches that are 10-12 inches apart in the prepared soil. Plant 2 seeds in the trenches every 12 inches. Water in well and cover with 2 inches of soil. After the French bean seeds germinate and reach 6 inches in height, gently rake 2 more inches of soil around the base of the plant. After a week or so when the plants have grown another 2 inches, rake more soil around the base of the plant to help keep it stable and support its rapid growth. As the soil is being raked around the base of the bean plants, create a shallow trench that runs parallel to the planted rows and close to the base of the plants. Use this shallow trench to provide food and water to your growing French bean plants. Fill the trench with compost, water in well, then place a 2 inch layer of organic mulch around the plant base and over the trench. This second application of compost, combined with the compost already in the garden soil, will be enough nourishment for the rapidly growing bean plants. Water deeply in the trench once a week during times of little or no rainfall,. The mulch will help retain the soil moisture and prevent weed growth. Depending on the variety of French bean you have selected to plant will determine how extensive the support system will need to be. The beans will begin to produce runners when the plants are about 10-12 inches tall and a support system should be in place by then so the runners can be trained to climb up the support and not along the ground. A metal or wood stake that is several feet tall placed in the ground at each end of a row is a good starting point for building a support system. Strong twine or wire can be attached to the top of those end support stakes with individual strands of twine or wire attached to it so they can hang down onto each bean plant. The runners will attach to the dangling wire of twine and climb upwards and across, providing the plants with plenty of air circulation and sunlight, plus allowing easy access for picking beans. Bamboo poles set tepee-style for several bean vines is another support option, as is placing one bamboo pole (or similar pole) in the soil at each plant. 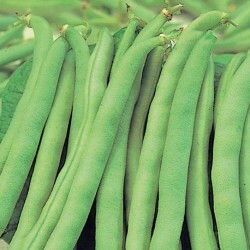 French beans are ripe and ready to harvest when pods are lumpy with ripe beans on the inside. The pods can also be harvested before they are full of ripe beans, either way the exterior pods and interior beans are eaten. 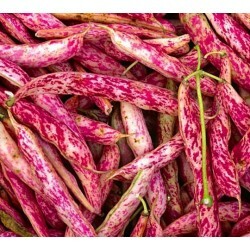 If French beans become overripe, the pods will be tough and inedible, but the beans inside are still viable. Shell out the interior beans and cook as you would dry legumes. Bean seeds can be easily saved by leaving some of the pods on the plants to reach full maturity. The seeds will swell in the pod till the pod will be bursting. Don't pick the pods until the seeds inside very hard. This variety is purple seeded, more fun to save the seeds, and the seed pods are decorative too in your garden as you leave them on the plants for longer.